This zebra directing traffic is not a joke. It is one of hundreds of city employees saving lives while making streets in La Paz, Bolivia friendlier for pedestrians. Photo via oneillinstituteblog.org. The city’s dancing zebras help promote a culture of pedestrian safety, and have become a point of pride for many city residents. Their impact goes beyond helping pedestrians cross the street. According to the Guardian, the zebras now lead educational programs in schools and public spaces on issues such as recycling, water conservation, and bullying. Their work is spreading. The zebras are aiming to expand with last year’s launch of the “Zebra’s Without Borders” project, which works to export the initiative to two additional cities in Bolivia and to countries throughout Latin America. Of course, the dancing zebras alone cannot solve La Paz’s pedestrian safety challenges, and they are no substitute for people-oriented urban design. Cities have a wide range of tools that have been shown to save lives, including improving intersection design, using traffic calming measures, pedestrianizing streets, and prioritizing sustainable transport. La Paz and neighboring El Atlo have recently improved sustainable transport options by building the world’s longest aerial cable car system. Cities across Bolivia also recently celebrated “The Day of the Pedestrian and Cyclist,” during which roads were closed to cars and pedestrians were given space for a wide range of activities. 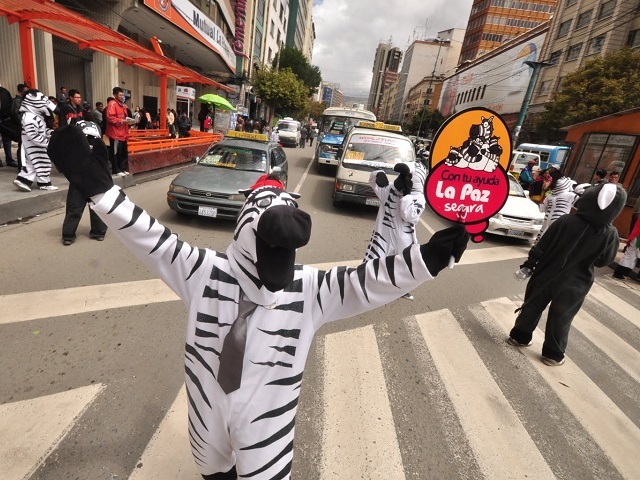 In addition to using more traditional strategies, La Paz’s zebras remind us that there is also room to think outside the box to improve traffic safety. In Lisbon, Portugal, a dancing traffic signal made pedestrians less likely to jaywalk. In cities like St. Paul, United States and São Paulo, Brazil, public art exhibits are used to help slow cars and improve safety. On World Cities Day 2014, it is important to remember that urban transformation comes in all shapes and sizes. Sometimes it is the most unorthodox ideas that are the most effective.